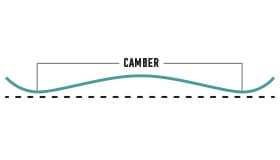 Camber: An advocate of powerful turns and poppy precision, camber speaks to the core values of board design. Offering a snappy suspension, camber distributes weight evenly over the entire length of the board for smooth, continuous edge control from tip to tail. Twin Shape: Perfectly symmetrical for a balanced ride that’s equally versatile when ridden regular or switch. Jib, spin, stomp, and butter with a greater balance of freestyle mobility and cat-like stability no matter which way you point it. Twin Flex: The flex is perfectly symmetrical from tip to tail for a balanced ride that’s equally versatile regular or switch. FSC™ Certified Super Fly® 800G Core: Lightened up and loaded with pop, our dual-species wood core utilizes dual-density vertical laminations of alternating softwood/hardwood to reduce overall weight with no sacrifice in strength or performance. DUALZONE™ EGD™: Engineered wood grains for more edge-hold, response, and strength. The wood grain is positioned along the toe and heel edges on two continuous zones, perpendicular to the rest of the wood core, for consistent edge-hold and added strength. 2 - Thicker/Stiffer Zones. Profiled core for easier board control, more energy, and pop. With an overall easier feel, Squeezebox Low brings high-end core profiling technology to the progressing rider. Stiffer zones just outside your feet create a more direct energy transfer to the tip and tail, while enabling a softer, smoother flex between the bindings. The end result is more control with less effort from the rider. FIBERGLASS: Biax™ Fiberglass. Features a jib-friendly, torsionally soft flex and forgiving, park-friendly feel. BASE: Sintered Base: Durable and highly porous, get added durability and superior wax absorption for greater overall glide. MOUNTING: The Channel™. Stronger, faster, easier, and more adjustable—The Channel® gives you ultimate control of your stance and your board in a design compatible with all major bindings (not just Burton’s). Better yet, all boards with The Channel are fully covered by a 3-year warranty. This means that if you have any issue with any part of the board, even if The Channel is in mint condition, you are covered. SUPER SAP® EPOXY: Super Sap® is a resin formulated with bio-based materials that reduces the carbon footprint by 50% over conventional all-petroleum-based epoxies. Less oil consumption means even less of a carbon footprint per board, which is good in our book. PRO-TIP™: A tapered tip and tail thickness reduces swing weight for easier mobility. INFINITE RIDE™: This Burton-exclusive technology allows us to maximize pop and strength by overbuilding the board, then putting it in a machine that breaks in the board for you. Whether you choose to ride Flat Top, Flying V™, or Camber, rest assured that with Infinite Ride™ your board will maintain its flex, pop, and feel from the first day forward, season after season. BURTON FAMILY TREE BOTTOM FEEDER 150 Tavola Snowboard 2019. BURTON FREE THINKER 154 Tavola Snowboard 2019.